Rotax max new Upgreads 2015? Home › Forums › General Karting Discussion › Rotax max new Upgreads 2015? This topic contains 34 replies, has 18 voices, and was last updated by James McMahon 4 years, 4 months ago. Why dose this thread keep getting kicked off the internet. Nothing has been made official as of today according to Rotax officials. When we receive an official statement, we will publish. Oh and BRP don’t really care for their customers . Forcing associations to make statements they probably don’t want to have to make to customers which iinturn unsettles the trust people have in the sport . Yea go Rotax , good guys. I glad i am not the only one who thinks this is BS. I think this is a good thing lets make the rotax motor faster and easier to drive. Yea making engine better and the like is fair game. We also have the kf/kz arena for that. 6000 Karters in Australia ( 7000 officially ) , roughly a mere 150 only bother to run rotax constantly . But Rotax don’t want to play that game . Even as they market it as recreational racing engine you’d think they would be happy to play the TaG game. But they don’t want play that either , so. What it does for parity in many organizations world wide within TaG is no real concern to them at all. They push for world rules but like here in Australia and just about everywhere else on the globe , importing your own at cheaper cost is no go. We need official stamp on casing proving it was purchased of specific dealers here. If it’s a control class and everyone has same engines you could argue that up grades aren’t even needed. The price increase alone contradicts the market they claim to reprent. This proven by many experienced karters complaint on the mojo as merely dissed with ” you don’t know how to set up your kary ” response . Upgreads LOL almost missed that. Tough to read the last few pages – the ones with the prices…. Over $1000 for all the Sr upgrades? This would be a good time for mini rok importer and iame west/east. to do some kind of deal to kill rotax . I for one am sick of rotax but stuck racing it because the only other option in my area is 4 stroke. The engines are all over the map in performance. Micro and Mini max class has turned into a dads checkbook racing class whom ever kid gets the #1 rental usual wins… yes I said rental because unless you got lucky or spent $20k to find a good barrel etc for these classes your renting at $1500 a weekend to compete. ITS A JOKE. since Rotax says that the old version Max will continue to be legal to race (for now), what if the old engine is better suited for one circuit compared to another? This strikes me as possibly a serious marketing error by Rotax. SKUSA is specing the X-30 and Italian Motors just introduced the X125. So now a rotax user is in the position of thinking “since I have to get a new engine eventually, maybe I’ll switch,” whereas if rotax had stayed pat it wouldn’t be putting its client base to that choice and that base would be much more likely to stay pat as well. 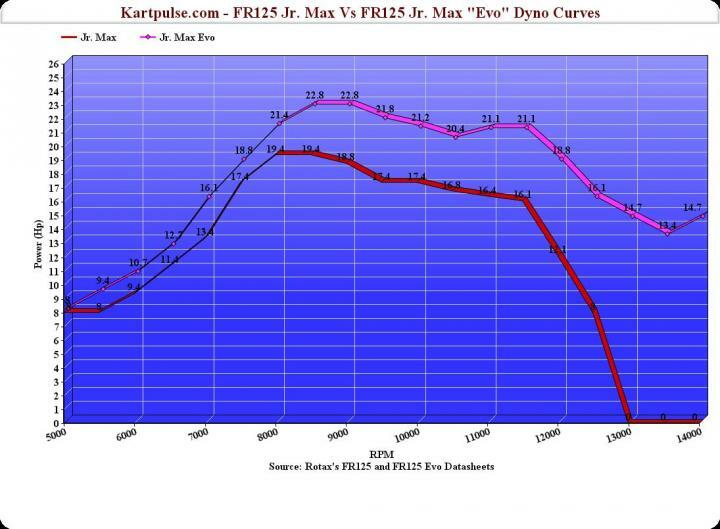 Comparing the dyno curves (from Rotax) for evo and non evo senior Max packages, the evo should have the upper hand on any track at any given time if it’s performing correctly. It’s not just 1.5HP more at the peak, its across the entire rev range from 7500. For sure it was a PR nightmare. With the leak of the document in Australia things started off pretty bad. X30 is a threat, its got some momentum behind it, aside from SKUSA running it. Not sure about the X125 though, time will tell. I’ve been expecting something like this ever since that Rotax survey was circulating last year. And honestly, I think everything looks pretty good. With IAME coming on strong and introducing the X30, it was clear Rotax was going to re-engineer the 125 MAX platform. Its proven to be a good platform for the past 15 years. But it was time to make some changes to address consistency and drive-ability issues people had with it. And it looks like that exactly what they’ve addressed. It would be nice to see some incentives to help existing owners upgrade, but it appears the inventory’s not there to do that just yet. But it wouldn’t surprise me to see something in the future. The piston is “no-brainer” – and will happen for all future rebuilds regardless. The carb to me is a must have, as it has always been the source of the jetting issues. The electronic power valve is a nice feature, but is not that critical as to need it anytime soon on an existing engine (so long as you’re the type that maintains your RAVE valve on a regular basis). So that removes it, and the new ignition coil and box, from the must-have upgrades list. All that’s left is the crank and con-rod. That might bite a bit in the rebuild charge, but that’s the biggest chunck of change IMO (and probably a significant portion of the power gains). Still, the Rotax market is going to be a bit crazy for the next year. The bottom’s going to fall out for alot of spare parts. I would say the the electronic powervalve will still need to be cleaned, just like the regular one. It will get gunked up in the same spots, instead of being adjusted/forced down by the spring, it’s controlled pneumatically by a solenoid with two modes to select from. The ignitions have different curves, jr for example is getting 2000 more RPM on the top than before. The big question is whether an upgraded Max will keep up with an Evo. I suspect if you have a Max with a good crank and barrel, it will be fine. The guys hurt by this are the guys that spent a ton of $$ to find the magic coil and/or carb for their Max. They are back to square one with the new parts coming on line if they plan to run with Evos. I guess I should be happy that the US Org for Rmax just changed the rules for 2015 so that my driver can no longer run in Rotax Masters. Now I won’t need the two Rmax engines I have, so I won’t have a need to update them. Anyone need a Nationals level winnning Sr Rotax engine? Looks like after 20 years of Karting, we’ve been legislated into retirement. anyone sic of rotax yet? I view the EVO to past 125 MAX motors more like the X30 to the Leopard. Its meant as a replacement and they took the opportunity to make wholesale improvements. I don’t think the situation is remotely similar. The X30 has no clear performance advantage over the Leopard, so you can stick with the Leopard and still be competitive without $1000 in upgrades or the cost of an entirely new motor. By significantly increasing performance, Rotax is forcing its client base to shell out some serious $$ to remain relevant on the track. It’s always amazing to me how people love to bash Rotax. IAME comes out with a completely new engine, the X30 and nobody complains. They show up at the various TAG races with both the Leopard and X30. Many have more then one of both. SKUSA will be eliminating the Leopard in 2016, USPKS will likely follow suit. Then we can all scrap all the Leopard engines we own. ROC is just getting started over here and they have just introduced their new direct drive engine. Is it inconceivable that ROC Cup will soon be direct drive? I believe I heard or read somewhere that Rotax would come out with an upgrade package of Carb, wiring harness, power valve and coil for around $500? Whatever it is, it will be far cheaper then buying a whole new engine. I can’t think of any reason the current engine with the EVO upgrade package wouldn’t be just as fast as the EVO. They haven’t changed the bore, stroke, cylinder or head to my knowledge. We run Rotax Junior. Best I can tell from what Rotax has published is that the only items that will provide a performance advantage with the new upgrades is the carb and ignition system. The carb has been redesigned to improve bottom end power/throttle response and minimize the effects of environmental changes so that the carb is much easier to tune. The new ignition system improves the power band and rpm in the 12K to 14K range. These were two issues that many customers have always bitched about…so Rotax fixed it! For the price of a cheap axle and sticker kit ($500) the playing field will better equalized. The other upgrades are designed to improve durability only. I don’t understand the post above at all. If the bottom end power and the 12k-14k power band were something people “bitched” about how did fixing these complaints make “the playing filed better equalized”? They were power issues present in virtually all Rotax motors. The field now is NOT equal since you HAVE to spend $500 (or whatever the price winds up being) or get clobbered. I guess the real question will be what upgrades Rotax will require the user to implement for the motor to be legal. Rotax’s own numbers. Plotted on a graph. Draw your own conclusion. Looks like the Evo’s will be better to drive but I can’t see the older models holding a candle to them, at the same weight. I feel you guys pain. I bought a legal Rotax back in 2009 because I wanted to become a Rotax service center. The deal fell through because of politics at F!NJ and glad it did from what I’ve read about how service center get hung out to dry. Anyway inside of a year the engine needed $900 in upgrades to be legal for RMC. Took me a while to sell it to a guy who runs auto cross but, so glad I got out from under Rota$, what a money pit. Throttle response and top end issues were more easily over come by the HAVES with better carbs and and coils that were found through many years of the product being on the market. For $388, everyone starts from scratch. Playing field equalized….for awhile. What we need to see is a dyno run on that graph above with the upgrades. That’s the one I want to see. If an older engine(2009 or newer) with upgrades is equal to the Evo. Otherwise all of our engines are toast! So what website sells the upgrade “Kit” for the Junior motor? Rotax dont have a graph for a motor that’s on the old rod/crank/piston with the newer upgrades. My guess is that an 09 spec with upgrades would be on par with a “full” evo. The difference you see in the curves is mostly down to ignition, a little carb and a little powervalve. Maxspeed (gorotax.com) and their distributors will be stocking the kits starting in Janurary.